Decorative glass is a widely used term to describe a variety of glass that has unique properties that have a look and feel like no other building material can. Decorative glass can be tinted, frosted, etched, glue chipped, patterned, textured, fritted with lines or dots, obscured, back painted and more recently technology has brought us the ability to get digital quality images to be printed and bonded to glass surfaces or in the laminate between glass lites. 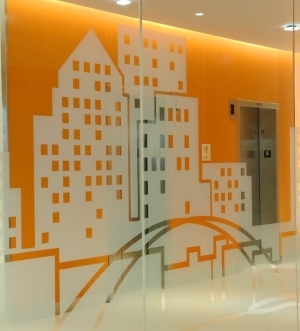 The most common commercial uses for decorative glass is for health care, office space, retail and hospitality segments and can be used as signage for any industry. Decorative glass can stand alone as a true decoration or be incorporated into a functional glass wall or glass railing. Decorative glass can dramatically change the feel for a given space and can be done economically depending on the product application. Flower City Glass has been using decorative glass since the great depression. Our firm has witnessed and contributed to the evolution of the decorative glass explosion. Decorative Glass or Art Glass is still glass and should be installed by professionals in a suitable method and may need to meet safety or other codes. Specialty glass is used in applications that require a particular blend of function, look and performance. We often use specialty glass for acoustical properties where sound transmission control is needed or X-Ray glass for use in medical facilities for RF shielding. We also regularly provide custom shaped curved or odd shaped glass to customers who have a need for this.